To be held at the Indira Gandhi National Centre for the Arts (IGNCA) from February 12-14, the cultural festival will include numerous competitions to be held across its 14 verticals. Aimed at tapping the immense potential that the young generation holds in the form of street plays, 48-hour film making challenge, writing declamations, poetry recitation, music band competition, dance, photography, painting, poster, cartoon and sculpture making is the three-day festival UDAAN Utsav 2019. Based upon themes such as ‘Art and Culture for Nation Building and Societal Development’, ‘Environment Protection’, ‘Challenges of New Media’ and ‘Equality for All’, the fourth edition of the cultural festival will witness more than 4,000 students from around 50 colleges and universities of Delhi NCR who will showcase their creative talents. 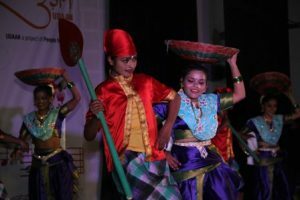 Convenor of UDAAN (Unfolding Drama and Acts for Nation) Sumit Maluja shared with Delhi Post that the event aims to “synergise mind, creativity, talent and passion of youth” to create strong cultural persons who are proud Indians too. “UDAAN started off as a Nukkad Natak four years back and has come a long way in embracing the versatility of the country’s various art forms in sensitising the people, and especially the youth about contemporary issues and generating in them a sense of belongingness and responsibility towards the nation,” he said. Though the festival is seen as a grand event that happens once in a year marked by numerous competitions, conspicuous audience and boisterous celebrations filled with fun and frolic, there is a lot more that remains to be read in between the lines, mentioned Maluja. “The celebrations are just a part of the bigger vision that UDAAN holds; which is to create a productive cultural platform on college and university campuses and provide opportunities to hone artistic passion and creativity of students. It aims to generate a bonding and sense of responsibility in youth for the society and the country and support them in building up positivity, team spirit and confidence,” Maluja further told Delhi Post. To be held at the Indira Gandhi National Centre for the Arts (IGNCA) from February 12-14 from 10 am to 7 pm, the cultural festival will include numerous competitions to be held across its 14 verticals. Eminent personalities such as singers Padmashri Malini Awasthi and Abhijeet Bhattacharya, M.P. Manoj Tiwari and many more will be seen at the festival which is set to witness an audience base of nearly 25,000 spread across the three days. As a platform for millennials to showcase their talents and explore their potential, UDAAN also extends mentorship and grooming in the fields of dance, music, theatre, writing, painting, sculpture making and so on, behind the stage. “Students get to attend workshops organised by different verticals where under the tutelage of various Indian maestros. They rise and shine,” said Maluja. Some of the well-known celebrities such as Anupam Kher, Anu Malik, Pallavi Joshi, Vivek Agnihotri, Manoj Tiwari, Padmashri Malini Awasthy, Ravi Kishan, Manoj Joshi, Nitish Bhardwaj, Gajendra Chauhan, Sonal Mansingh, Padmashri Nila Madhav Panda, Victor Banerjee, Mukesh Khanna and Sandeep Marwah, etc. have been associated with UDAAN Utsav and have provided mentorship to the youth from time to time.